How to pack light for Christmas holidays | Where's Zoe now? Normally I have a really easy time of this — I fly directly to Australia so I just throw a bunch of tshirts and a few pairs of shorts in a bag (clean or dirty, doesn’t matter, I can always wash them when I arrive at my parent’s place) and bam. This year, I’m heading to Germany tomorrow for Christmas and flying from there to Australia on the weekend. This raises the difficulty level enough that I need a step-by-step guide. Step 0: Be overambitious. Carry-on only! 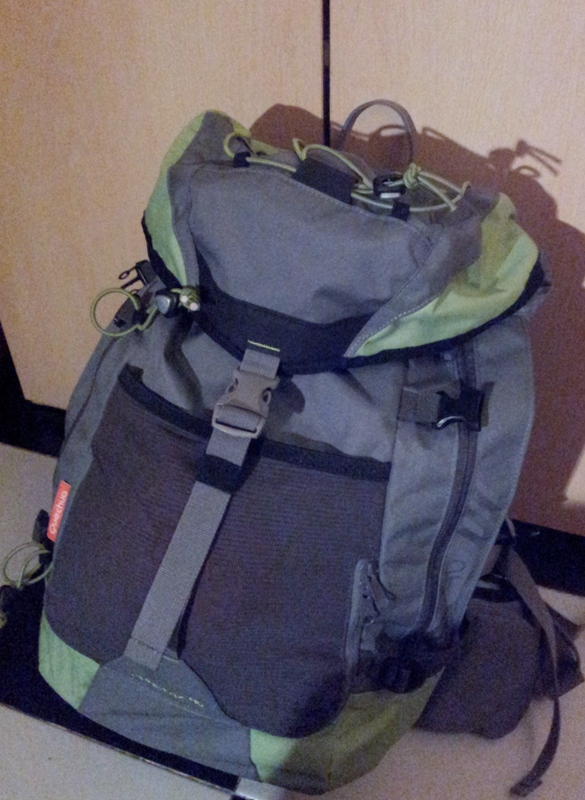 A smaller backpack than anyone would think reasonable for 3 weeks! Bring the laptop even though it’s bulky! Step 1: “This will be easy.” You just need to substitute warm clothes for some of the tshirts, right? Start making a pile of clothes on the bed. Step 2: Look at pile of clothes on the bed. It’s such a small pile! Add some more clothes. Step 3: Put clothes in bag. Awesome, they all fit! You are the queen of minimalist packing! Step 4: Oh yeah, your laptop needs to go in there. And the power adapter. And your journal. And a book to read on the train tomorrow. And some snacks. And shoes. Step 5: Pull clothes out of bag. Start putting other things in. Ditch some tshirts. Step 6: Repeat steps 3-5 a few times. Consider the fact that you have a Bachelors degree in mathematics but are unable to work out if a collection of items will fit in a bag without actually putting them in there to find out. Maybe this is why you’re now a physicist. Step 7: Procrastinate! Make dinner. Clean the apartment. This is a vital step since procrasti-cooking and procrasti-cleaning are your primary means of eating a nutritious diet and not living in squalor. Step 8: Try to find ways to leave things out. Maybe if you stay up all night reading the book you were going to read on the train, you can sleep on the train tomorrow and leave the book at home? Realize this will save you a small paperback’s worth of space and will make you miserable. This is barely enough to dissuade you. Step 9: Success??! You have a bag, it has stuff in it. Time to pull your laptop back out and write a blog post about this. Maybe with an insufferably smug title that positions you as some sort of expert, like “How to pack light for Christmas holidays”. Step 10: Realize you haven’t packed any toiletries. Packing is the worst. This entry was posted in Uncategorized and tagged backpack, pack light, packing, procrastinate, travel on December 21, 2014 by Where's Zoe Now?. I agree packing is the worst!!!! Just buy new summer stuff when u get to Perth! Step 11: Your cat falls asleep on the backpack and covers it with hair.